Sometimes, there is no better remedy, but to seek for a temporary escape. Besides, everybody deserves a little break especially from the things that are causing fatigue. Sailboats on White Beach, on Boracay, Philippines. Caryl Estrosas photos. Long holiday sounds impossible, but certainly a weekend retreat is manageable. The five of us—me, Mia, Belle, Hannah, Michelle, and Camille—knew that it was high time to momentarily leave the hustle and bustle of the metropolitan life, and the romantic and domestic dramas. We needed a time off, loosen ourselves a bit, cool our heads, and perhaps experience being the happy girls we knew we were. Where else in the Philippines would be the perfect place for us to unwind, but in Boracay. Boracay is an island situated in the southern part of Manila. Blessed with nature’s perfect white sand and pristine azure waters, it is an undeniably a perfect escape from the city’s turmoil and from our wearisome routines. It is impossible not to fall in love with the beautiful place. It is a paradise for the beach bummers and the nature lovers like me. It is also a pleasure island for the party animals. In fact, many tourists would come from afar just to experience the Boracay party. By day, you hit the beach for sunbathing and a relaxing swim or get adventurous with the sports water activities; and by night, you get to party with your friends. There is no time to be doing nothing, as fun simply never ends in this little island. We booked via Cebu Pacific Airlines and took advantage of a promo bound to Caticlan. Typically, the airline offers specials for both domestic and international flight. Once you see a special on the website, you need to act fast because they immediately ran out of seats. So, we packed our bags and flown to Aklan, the province of Boracay. We didn’t have any specific plans except for how to get there. There are two entry points via plane: Caticlan Airport and Kalibo International Airport. The town of Caticlan is just one ferry ride going to Boracay Island. In less than an hour after our arrival airport, we were already happily walking along the seashore of Boracay. Kalibo, on the other hand, is 2-hour away from Caticlan. Vans, minivans, and coasters take tourists to Caticlan Jetty Port. Experiences are always the great teachers. Learning from our previous trips, we made sure that our Boracay escapade would be totally stress-free. And that means, we have to travel light. I personally learned my lesson. Vacation is supposed to be fun, but there is no fun in bringing heavy bags or cumbersome luggages. It is too exhausting during transportation transfers and, the worst part is, you actually going to need only few of the things you pack—what a waste of time and energy! The White Beach in Boracay. Swimwear – Bringing one or two is fine. I packed a two-piece swimwear, but I bought a bathing suit at the D’mall in Boracay for P400, which looked decent enough to cover unwanted bulges. Walking tops and shorts – It is comfortable to wear something loose, light, and cottony. It works great for hiking and other outdoor activities. •Towel/Face Towel/Sarong – Towels are options. We can always borrow one from the hotel. Beach bag or sling bag – This is necessary for the valuables when strolling, unless you decide not to bring anything except for your money and camera. If we missed bringing some thing, well, we were never worried because D’Mall was just nearby. It is the shopping center in Boracay where you can find almost everything from souvenirs, medicines to tattoo parlors and dental clinics. Boracay Island has enticing beaches that are at par with the world’s greatest beaches. It is not surprising that it ranks second on Tripadvisor.com list of Travelers’ Choice Beaches Award-winning World Beach Destination. The famous White Beach is absolutely stunning with its long stretch of fine white sand and its calm blue waters. This is one of the primary tourists’ destinations not only because of the beach, but also because of the long chain of commercial establishments at the beachfront and the endless partying in the area. The long queue of resorts, hotels, lodging houses, coffee shops, restaurants, bars, clubs, and other shops keep tourists very busy all the time—leaving just a few hours to sleep. We stayed in Eriko’s Guest House, which is a just few minutes walk to the White Beach and to everything else. It was the top choice for our budget travel. It was inexpensive and the place was good. It has all the necessary things we needed: beds, bathroom, sideboard and drawers, towels, and wifi. And because we intend to stay outdoors most of the time, we just literally need a space to leave our things, to take a bath, and to sleep. We decided to squeeze ourselves in a family type-room. We pushed the two queen-sized beds side-by-side to accommodate us five, er, four actually as one had to escape the rest of us for a lover’s tryst. Breaking away from the crowd at the White Beach, we went to Puka Beach for some peace and quiet. The beach almost felt uninhabited. It was an image of a serene tropical island. The only music that broke the tranquility was the sound of the waves, the breeze, and the swaying of the palm trees and bushes. Puka got its name from the Puka shells that are used by locals for their jewelry making. The sand is coarse in this part of the island and the waters are rougher and deeper. A quick tour via buggy car gave a glimpse of the idyllic rural life. The ride let us smell the fresh unpolluted air and see the lush scenery—a simple thing that we couldn’t do in the city of Manila. The steep climb in Mt. Luho, the highest peak in Boracay, was all worth it. A small park that houses a Philippine eagle, birds, monkey, and snake greeted us. From the top, it gave us a panoramic view of the entire island where we can clearly see the Bulabog Beach, Puka Beach, and the golf courses. The creaking sound of the bamboo-made bridge and viewing deck was a bit frightening. Good thing none of us was acrophobic; hence, we made it through. We even climbed that iron stairs that swayed when blown by a strong wind. It felt shaky to carry our weights so we climbed down fast after we had taken our pictures. It’s a cliché you would hear too often in this small party island. As a matter of fact, a tattoo artist I’d met at the dance floor whispered that. Pretending not to care, I just danced to the lively music being played by the cute DJ in Summer Place. The bar is one of the popular places to go for drinks and dancing. “Of course, I know,” I said. Who wouldn’t? Whatever that means to other tourists, I think I perfectly understand what the guy was saying. Dance floor at the Juice bar. Juice Bar was our favorite hangout. Not only they played a great music selection, their waiters and DJs were super friendly too. We loved lounging on the beanbags with our drinks. Lazily sitting, almost lying on the sand, made our position conducive for people-watching and stargazing. 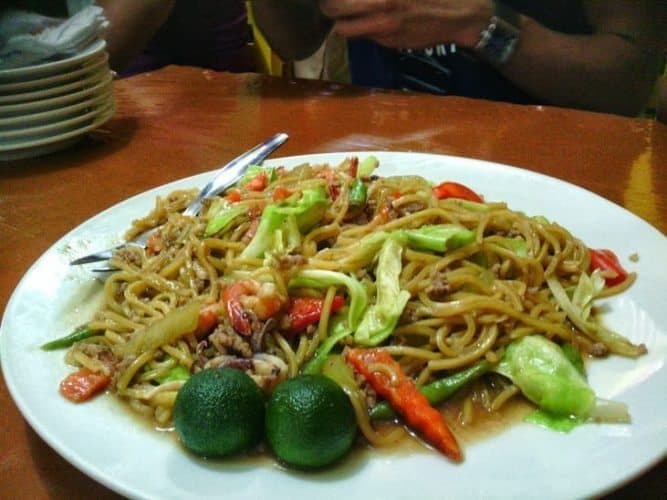 The Boracay trip was a true gastronomic experience. We enjoyed every meal we had as much as we enjoy the beach and the nightlife. At the D’Talipapa, we bought fresh seafood and had it cooked in one of the restaurants. Seafood products were cheap compared to those sold in the city. Surely, it was at its freshest too. While waiting for the food to be prepared, we took the time to roam around and find some merchandise to buy. Our meal was ready as soon as we got back. We hungrily feasted on the shrimp with garlic, tinolang isda (fish soup with vegetables), fried fish, and rice. A day in Boracay was not complete without a dose of Jonah’s fruit shake. My choice was mango flavor. It was unbelievably the most delicious fruit shake I’ve ever tasted. It was sweet and creamy—nothing comes close to it. I jokingly asked the staff if they have a delivery because I would love to have one delivered to Manila. One memorable dinner we had was at the Jungle Bar when we had the entire place for ourselves. 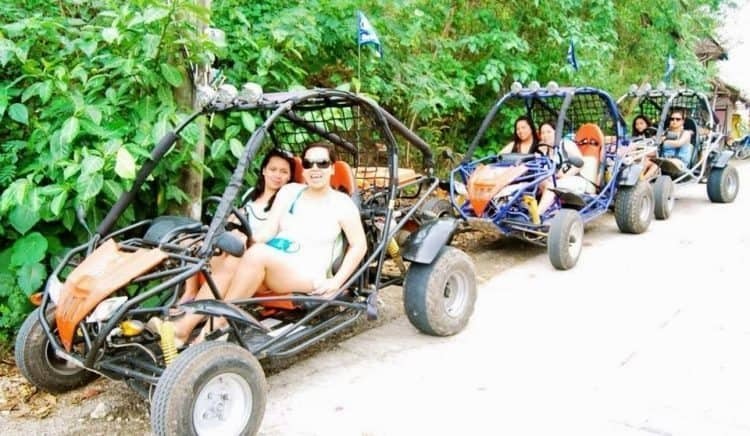 Located at the Bulabog Beach in the eastern part of the island, an off the beaten track, we had to take a 20-minute tricycle ride to reach the place. We arrived thinking that we were lost. I started to feel like the place was actually an old witch secret abode or a rendezvous of a coven because of its quaint decor. However, we smelled something familiar and delicious that prodded us to go in. I can still imagine that puzzled look on our faces while asking each other, “Where are we?” Then we saw the Filipino dishes laid on the tiki bar waiting for us—the chicken adobo with eggs, salad of salted eggs and eggplant, fish in vinegar sauce, and, of course, loads of rice. Our hosts welcomed us to the Jungle, played the tribal drum music, and turned the disco lights on. The party was too early at the Jungle Bar when we came. They said that guests arrive late and party until the break of dawn. Typically, they have the tribal drumming sessions, endless music, drinking, and dancing. This is also the very place where full moon parties are held. We spent our last night sipping coffee frappes while Mia was reading our horoscope aloud and fabricating her interpretation at the poolside in La Carmela Hotel de Boracay. I personally do not believe on horoscopes, but it is so much fun every time we have this little session. Mia has her way of explaining things and making the horoscopes seem personal and believable. The girls on top of Mount Luho. Looking at my gorgeous girl friends, I was simply happy to be with them on that amazing weekend getaway. I had so much fun. Yes, it was because of the fabulous beach, the exciting tropical parties, and delectable food. But more than that, it was the company that made the trip special. I knew that when we get back to Manila, we will be inundated with stuff and we will be busy with our lives and our careers. However, we were certain that we will be coming back to experience more of the Boracay fun. I hope we will travel as a group again, just like what we did that weekend. Caryl Estrosas gave up the corporate world to work as a freelancer. She lives in Manila, Philippines.